[img]http://biologic.xyz/downloads/images/lumisortwincrop_1_thumb.png[/img] is not a valid Image. Converts raw data files from the Turner Designs TD-20e luminometer to Excel. 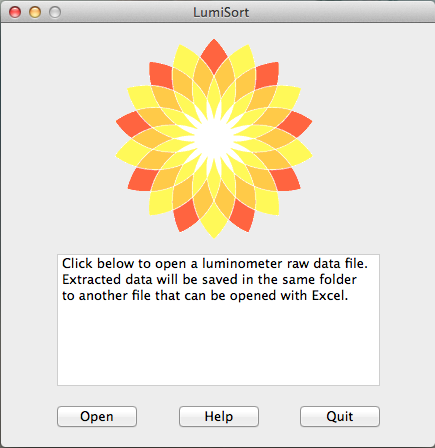 LIght intensity values are extracted and saved to text files that can be opened with any spreadsheet software or text editor. Successive runs appear in separate columns. Written with XoJo. Code signed with AppWrapper. Requires MacOS X 10.6 or later. Tested in all OS X versions from 10.6 to 10.9. Not tested under 10.10 (Yosemite). 1. A serial adapter board inside the luminometer connected to a computer. 2. Generic terminal emulation software on the computer to acquire raw data.